Welcome to the GEOMAP website. 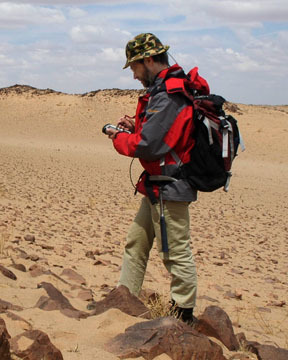 Mapping with the TDS Recon handheld computer linked to a GPS receiver. Outcrops are recorded as polygons and attributed in the field. Data is exported at the end of each day and imported directly into a GIS package, eliminating time consuming digitizing and giving immediate access to the data as the mapping proceeds. Hello, My name is Nick Tate and Geomap is my geological consulting firm. I specialize in mineral system mapping with the ultimate goal of finding OREBODIES. My particular niche is intrusive related base and precious metal systems including epithermal, porphyry and plutonic environments. In these systems, understanding the hydrothermal fluid system and the intrusives that drove it are invariably the keys to finding ore.
That kind of understanding is best achieved with detailed mapping of alteration and the structures that control it, combined with careful separation of intrusive facies and potential host rocktypes. The mapping techniques I have developed are specifically aimed at extracting precisely this information. My daily rates are commensurate with my level of experience and I always strive to ensure that my clients get genuine value for the time I spend on their projects. Geomap now has a base of operations in the Lao Peoples Democratic Republic (Laos). The Lao office is focussed on generating and servicing new mineral exploration projects in Laos. Over a 5 year period, we have developed a valuable understanding of the geological, operational and technical issues involved in the Lao exploration industry. In particular we have collated a substantial database of GIS information and a deep understanding of the issues related to GPS data collection in Laos. We have developed methods for working with all the historical map datums in Laos including custom setups for Garmin GPS units to use Lao maps datums. See links to setup instructions below (.pdf documents). 1. Eliminates digitizing and time. This cuts total time to produce a final map by around 30%. 2. Data is available for use in the clients system as the mapping progresses. 3. Improved accuracy. With a hand held GPS, maximum location errors are approximately 10m, which is generally better than the errors due to distortion in aerial photographs. I also have a variety of other DGPS systems which can produce survey grade positioning (+/- 2cm xyz) if required. 4. Eliminates gridding. Real time location provided by the GPS eliminates the need to lay out grids to control mapping. Virtual grids can be laid out in the unit if regular sampling intervals are required. 5. No more sample flagging. Sample sites recorded with the GPS can be easily relocated without the environmental problems associated with flagging tape and metal sample tags. 6. Consistent data collection. The data recording software can be set up to match your existing data structure. For example, rocktype fields can be assigned a menu structure with lists of known rock codes. The database style entry also helps to ensure that each field is filled for every outcrop. The system does have limitations. In particular the GPS signal is not usable in areas of heavy forest cover or very steep topography. I have compiled some detailed information on GPS in the real world from my experience developing the system. I have tested the system in a wide range of field environments for eastern Australia and Asia. The results were surprisingly good. The critical factor in vegetation cover seems to be the style of foliage. The signal is worst affected by broad leafed trees which form a complete canopy. Narrow leaved trees (including most eucalyptus) have a relatively minimal effect. In one test I discovered that an almost impenetrable scrub of narrow leaved acacias had almost no effect on the signal. 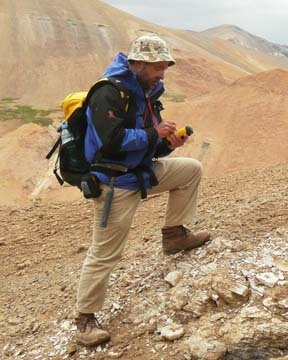 This environment would be almost impossible to map with any other technique except line clearing and survey. In areas where the GPS is not usable, I still use traditional mapping and surveying techniques. 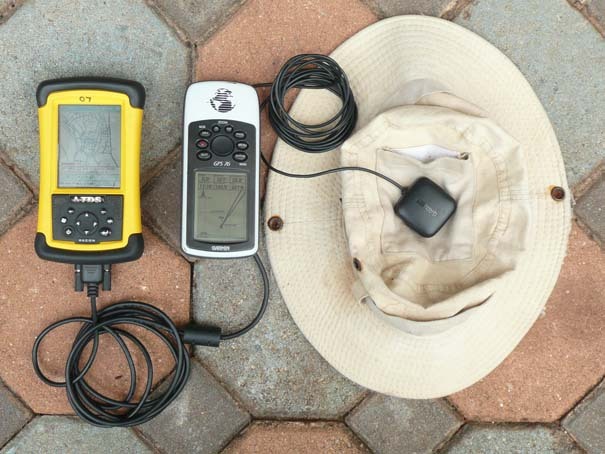 Detail of the TDS Recon with a handheld GPS receiver and an external aerial fitted to the geologists hat. With this configuration accuracy ranges from 2m to 10m depending on tree cover and satellite availability. Errors can be reduced to less than 2cm with a backpack mounted Differential GPS system. If you would like to see how the system performs in your environment, I can arrange an on-site demonstration free of charge.